On 28 February the ‘Beast from the East’ arrived with a vengeance and much of Scotland ground to a halt. Roads were impassable, public transport stopped, schools and workplaces closed and panic buyers cleared supermarket shelves! After three days of snow we had cabin fever. When day four dawned, Scotland’s fleet of snow ploughs had cleared an escape route out of town. We took it. A few hours later we arrived on the snow free Ardtornish Estate in Morvern. Rose Cottage would be our home for the next five nights. Having visited the estate in autumn, then again in winter, we were hoping to find signs of spring at Ardtornish. Rose Cottage sits on a lovely spot by the River Aline. From outside it looks tiny, but it’s tardis like inside. With three bedrooms, two bathrooms, a lounge and a large dining kitchen we had plenty of space for eating, sleeping and relaxing. Modern bathrooms and a fully fitted kitchen meant we had all mod cons too. Iron bedsteads, antique furnishings and whitewashed floorboards in the bedrooms and lounge gave the place a homely, traditional feel. Perfect for a cosy cottage on a Highland estate. You may wonder what there is to do in a remote part of Scotland, out of season? So let me show you. We celebrated our escape from snowmaggedon with a trip to the beach. Getting to Sanna Bay involves a drive with more twists and turns that a roller coaster ride, but it’s worth it. It felt great swapping snow for sand. The boy must have thought summer had arrived, as he shot straight into the water! As inviting as it looked, we didn’t join him for an icy dook. Leaving the beach we hit a traffic jam, but not the sort that sends the blood pressure soaring. This was a woolly traffic jam! Woolly bottoms were replaced by a herd of stags crossing the road. We pulled over to watch the majestic beasts. Our first evening at Ardtornish was spent by a roaring log fire – heaven. Day two began with a hearty bowl of porridge topped with Gleneagles & Co blueberry and Glenturret whisky jam – the breakfast of champions. Porridge eaten, we drove the three miles to Lochaline, and hopped on the ferry to Mull. The 18 minute crossing makes Ardtornish a perfect base for exploring the beautiful Hebridean isle. When we caught our first glimpse of Calgary Bay we both let out a “wow” – the sea was a vivid shade of turquoise. We couldn’t park the car fast enough to get onto the beach. After a run around on the sand, we followed a path by the side of the beach which leads to an old pier. I spotted a pair of white-tailed sea eagles overhead and watched them soar. We enjoyed some art and elevation next. Art in Nature is a trail on a wooded hill at Calgary Bay. There are lots of interesting artworks dotted around the trail. It’s well worth visiting, and it’s free. There’s a gallery and cafe on-site too. The cafe serves good quality teas/coffees, and light lunches. A highlight of the trail is the fantastic view of Calgary Bay you get from it. We stood gazing at the turquoise sea, and for the millionth time uttered the words “who needs the Caribbean”. No trip to Mull would be complete without visiting Tobermory. The sight of the town’s colourful houses always fills me with joy. Before heading back to the mainland, a tasty lunch of pulled beef chilli, macaroni cheese and lime cheesecake was devoured at Macgochan’s. Back at Rose Cottage, we spent another lazy night by the fire. We were really settling into the mellow pace of life on the Ardtornish Estate. Day three began with more porridge and a generous dollop of jam. After breakfast we hopped in the car and drove towards Mallaig. We were treated to stunning views – mountains, boats bobbing on a clear blue sea, and the Small Isles silhouetted on the horizon. Next, came sights instantly recognisable to fans of the 1980s movie Local Hero – a tiny Highland church and white, sandy beaches. Movie beaches explored, points of interest visited and a delicious lunch at the Glenuig Inn eaten, we decided to indulge the boy with more beach, based fun. Being fans of remote corners we made for Ardtoe in Ardnamurchan. Ardtoe boasts a pretty beach, with gorgeous views towards the Isle of Eigg. It’s all but deserted too – or so we thought! Ardtoe – a fair fleg! We explored rock pools, as the wee dug bounded around like a puppy. I climbed a rocky outcrop to admire the view, as the boys goofed around on the beach. What happened next felt surreal! I was watching the boys larking, when a white horse appeared and galloped towards them. Shocked, Mr G swept The Wee White Dug up and ran. It turns out the Highland Pony was friendly, and was only looking for a pal. The boy wasn’t bothered a jot by the hullabaloo. Travelling as frequently as he does, nothing surprises him anymore! We wandered a while longer, enjoying the solitude. When another dog walking couple appeared, we left. Four humans and three dogs sharing a beach was waaaaaay too crowded. Ardtornish was turning us into recluses and we loved it. Back at our but n ben it was time to spend another cosy night by the fire. As luck would have it the Pickering’s Gin tree in the garden had just produced a bumper crop. Mr G popped outside to harvest the gin and a relaxing night was enjoyed by all! Day four dawned bringing rain, but we were undeterred. We decided to drive to Ardnamurchan Lighthouse, then wind our way back towards Ardtornish throughout the course of the day. It was a tad blustery at the lighthouse, but beautiful all the same. Despite a stiff ‘breeze’ and the cold biting at our fingers we saw an eagle AND got the place to ourselves – result! We met some wild goats next. It was turning out to be a good wildlife spotting day – not the norm for me. After a fab take-away lunch from David’s Bakery in Acharacle we were ready for a walk. We stopped at several short trails on the road between Salen and Strontian, exploring woodland and shore. We timed our arrival at Garbh Eilean Wildlife Hide perfectly, spotting an otter within seconds. I had binoculars with me too, which is almost unheard of. We watched the otter, scared to breathe in case it heard us and scarpered. When it finally disappeared a seal appeared, then some noisy geese. The boy had been as quiet as a mouse as we watched the wildlife, so he was rewarded with a loop round the walking trails by the hide. You’ve probably guessed that we spent the evening in quiet, conversation by the fire. Hopes of sunshine for our final day were dashed when we woke to the sound of rain. Jam laden porridge eaten, we waterproofed up and headed out to enjoy Morvern. We followed the eleven mile road from Lochaline to Drimnin, hoping the rain would bog off. The rain stopped. Could it be down to the powers of Clach na Criche (Wishing Stone)? The wishing stone is a rock wall that was created 60 million years ago by a super volcano. Scattered cairns sit on either side of the stone wall. Funeral parties travelling from Lochaline to Drimnin used to stop at the stone to rest. Mourners built the cairns to remember their loved one. Legend says if you can pass through the hole in the stone three times without touching the sides, while carrying a mouthful of water from a local spring your wish will come true. We looked but found no spring. Probably a good thing as I develop two left feet when I climb, so I’d likely have crashed through the stone and lost teeth! As I stood on the Wishing Stone a gorgeous beam of light appeared over the Isle of Mull. It started to rain as we arrived at Aoineadh Mor. This was a walk I was looking forward to, so rain wasn’t going to put me off. Two trails led from a wooded car park, James’s Path and Mary’s Path. We took James’s Path, the more arduous of the two but worth the effort for a rewarding view. Both paths met at what used to be a thriving township – Aoineadh Mor or Inniemore. Mary and James Cameron, the namesakes of the paths once lived in the township. In 1824 the landowner in Edinburgh gave notice that the village was to be cleared to make way for sheep. Decades later, Mary Cameron’s retelling of the clearance was documented. You can hear her account of eviction day in an audio recording. It made me cry, so I gazed off whimsically into the distance, hoping Mr G hadn’t noticed. When they left Inniemore, James had to carry his elderly mother off the hill on his back, while Mary helped their young children, one still a nursing baby. Before they were out of sight their home was destroyed. We wandered round the remains of the township, and for once it felt right that it was raining. That human beings could be treated so heartlessly for profit is sickening. We left via Mary’s Path and although sad, this walk in a remote part of Morvern was the highlight of my trip. Ravenous after our walk, we gorged on comfort food for lunch. Our afternoon would be spent hiking on the Ardtornish Estate. After awesome hot dogs, lentil soup and a tiffin slice from the Lochaline Snack Bar we were raring to ramble. Back at Ardtornish we left the narrow road that skirts Loch Aline and headed uphill, following a faint path. We were looking for Tennyson’s Waterfall. It’s named after the famous poet who visited Ardtornish and described it as heaven. After wandering aimlessly, listening for the sound of thundering water, and having our usual “we’re lost and it’s all your fault” niggle we found the waterfall. It was only a trickle, but it was a lovely secluded spot. We rested a while, feeling like the only two people and wee dug in the world. It was time for some castle exploring. We followed the loch-side road and soon met a stag, who eyed us suspiciously. He was joined by a handsome friend, but neither were up for getting into iPhone photo range so we moved on. After what felt like an endless, yet scenic trudge the ruins of Ardtornish Castle came into view. The castle stands by the Sound of Mull and has incredible views across to Mull. Ardtornish Castle dates to the 14th century, and was once a Clan Donald stronghold. Donald of Islay, Lord of the Isles died there in 1386. His funeral procession sailed from the castle to the holy isle of Iona for his burial. After exploring the ruin we turned and began our trek back to Rose Cottage. We rewarded ourselves with a final cosy night by the fire and fizzy wine. There’s always fizzy wine! We left Ardtornish with heavy hearts. We were going to miss rambling in the wide open spaces of this lesser explored corner of Scotland. If you’re planning a road trip in Scotland and want tranquility, stunning scenery, history and wildlife then Morvern is the place for you. Let’s keep it a secret though, as heaven forbid we’re forced to share the place! Thanks to Kat for inviting us to discover the delights of the Ardtornish Estate. Although our accommodation was provided on a complimentary basis all opinions are my own. Thank you for your lovely stories of your travels, it really makes this London based person happy! And particularly seeing the wee white dug in most of the pictures. Thank you for reading. It’s an amazing place to walk and escape from it all. We absolutely loved it. When you go on your hikes, do you use something like an ordnance survey to find your way? 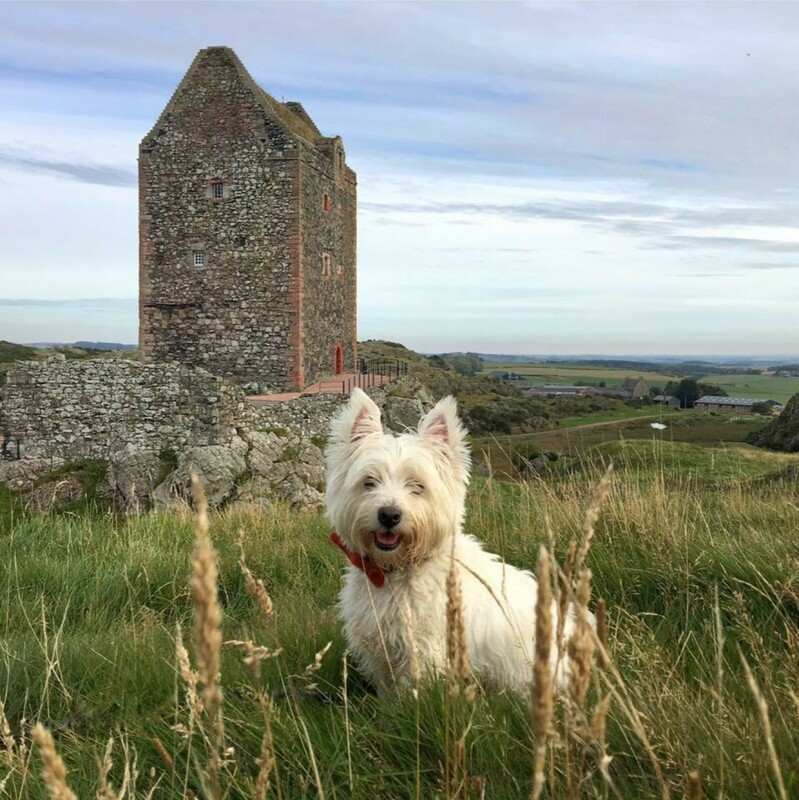 My family and dug are moving to St. Andrews for a year from the US and would love to follow in your footsteps around Scotland. If you had a year of school breaks to fill traveling in Scotland, where would your top spots be for each time of year? I have read that everything in the Highlands closes for the winter but suspect that can’t really be true. Our kids will be 11, 13, and 15…and the dug is 2! Hi Lydia, that sounds like a wonderful adventure. Scotland has a definite tourist season but you can travel all year and you’ll always find place to eat and things to see and do. I often prefer the winter months as it’s lovely and quiet. I’d suggest seeing as much as you can and try to see a mix of different regions too. Lots on the blog and I’d thoroughly recommend anywhere I’ve written about. You’ll find lots of marked walking trails on your travels and also there’s a website called Walkhighlands which is great. Lots of walks, for all abilities all over Scotland on their website. That’s my go to for hiking inspiration. I never use Ordinance Survey. Ha ha yes they’re not to be ignored. It’s a really well researched websites and I love that they include walk photos so you can gauge if you’ll enjoy the walk. Again – many thanks for sharing your lovely experience on the Ardtornish Estate. Having holidayed in and around this area – though not yet on the Estate – I would love to stay at Rose Cottage and breathe in the peace and natural beauty of the place. Loved the photographs – and – Caspar’s outdoor wear, particularly the grey coat with multicoloured Harris bow tie outfit! I hope he’s now been forgiven for the missing piece of sausage!! Congrats to Mr G for his recent photograph chosen for inclusion in the BBC Scotland’s ‘Send Us Your Photographs’ section. Great blog – as usual! Thanks, Sam. Another amazing and fulfilling adventure for man and beast! Thanks for sharing. Thank you for reading and for your kind words. It was a lovely, peaceful trip. I, too, have a wee white dug (but a “she”) who loves to travel. Hopefully one day my hubby, doggie, and I can travel to Scotland (we live in San Antonio, Texas) and visit these lovely places you’ve shared! Aww so glad reading this makes you want to travel. We loved this trip. It was an absolute escape from everything. Morvern is such an under appreciated region which is crazy as it has so much to offer.